Ask your average Israeli venture capitalist to name a few companies they’re keeping tabs on and Fixya usually makes the short list—so do Benchmark’s Conduit and Sequoia’s Kenshoo. If you haven’t heard of Fixya, the concept is real simple: It’s a post-sale tech support site. On the one side you have users who ask product support questions, and on the other are users who respond and help resolve said problems. In short, Fixya has managed to build itself up as a UGC powerhouse and is systematically milking the cow for all she’s worth. And now it’s adding yet another udder to milk—Product Recommendations and with that it’s delving into new territory, that of pre-purchase support. Not blown away are you? Understandable. That’s because you need to step back to appreciate just how big this here cow can grow and why VC’s are enamored with it. Fixya’s site content now spans a staggering one million products, covering everything from electronics to baby strollers. The site is seeing 15M unique users (mostly English speaking) that generate 60M monthly page views. 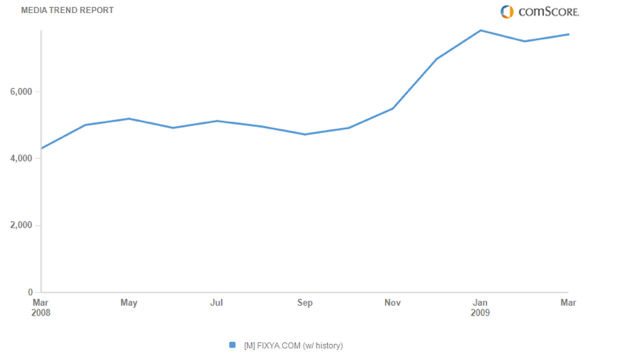 (ComScore shows half that, with 7.7M uniques visitors a month—see chart below). 250,000 questions are asked and answered per month—75% of the answers are rated as ‘good’ or ‘excellent,’ with 50% answered within 5-6 hours of posting. Interestingly, most questions are about usability issues rather than technical ones. 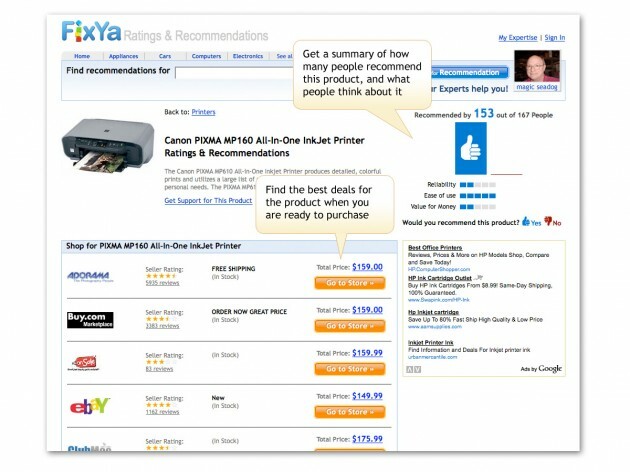 With its new Product Recommendations Fixya is leveraging the large amount of consumer feedback users are providing about products they already own in order to help other users considering buying the same ones. 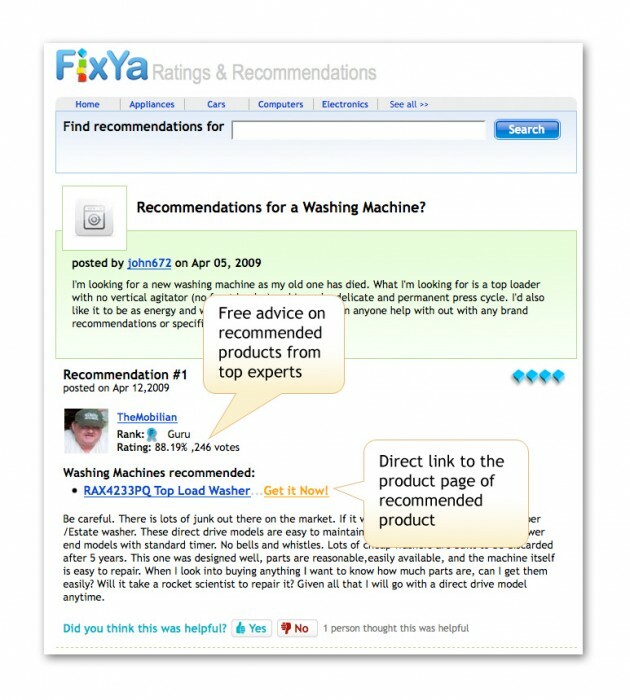 Recommendations are indicated with an overall thumbs-up/down, along with the number of users whose recommendation was rated as a thumbs-up (Fixya weights the user’s vote on product reliability, ease of use and overall value). There are also written recommendations that help users with deeper insights. The information is all there, but they could do a better job displaying it by taking a cue from Amazon. The end game, explains CEO Yaniv Bensadon, is to establish a type of Net Promoter Score (which is a measure of customer loyalty) for products and their manufacturers. Assuming it can pull it off and traffic comes flooding in, Fixya can turn on an additional revenue stream by allowing its community of 250,000 experts to offer pre-sale support for a premium—this shouldn’t be too difficult seeing as it already does this with post-sale support. Theoretically should Fixya be able to establish the critical mass necessary, it could form a social commerce network, where consumers collaborate with each other on product-specific issues. SEO – Due to its spanning across so many products it’s managed to institute some extraordinary SEO juice for itself. I Googled four electronic devices that sat on my desk using their name and the keyword ‘support’ (i.e. ‘hp l1706 support’, ‘seagate freeagent support’) and Fixya came-up in the top 5 results for all. Advertising – 50% of Fixya’s revenue comes from a variety of ad formats (ppc, sponsorship and display). Here’s something that blew me away… Again, thanks to its broad product catalog, Google AdSense actually generates real revenue for Fixya. Just how real? They’re generating eCPM’s of $2-3—that’s eCPM, not CPM and on AdSense no less. No one else I know is pulling these numbers off AdSense. Premium Support – Fixya facilitates live support between its experts and users. Incidents are priced between $10 and $20 and Fixya cuts a commission for the facilitation. Lead Gen – Fixya generates leads for local providers of support, warranties and parts. Commissions is the name of the game here as well. Future Directions – In the works are a self-serve ad platform which will allow targeting based on products, categories, brands, and geo-location. Fixya is also planning on white-labeling portions of its services. Doing so will allow it to approach the likes of Sony and offer to reduce costly outsourced tech support by instilling crowd-sourced features (and even generate additional revenue along the way). So there you have it… A company that is able to transform user-generated content into a money making machine. It’s no wonder that Bensadon smiled and said ‘much higher’ when I mentioned to him that I keep hearing $60M as the company’s expected exit mark. You would be smiling too, wouldn’t you?